Wet to dry. Swamps, upland woods. This is a moderately fast-growing, moderately long-lived, medium to large, deciduous tree rising on a single trunk from shallow, horizontal roots. In Minnesota mature trees are usually 40′ to 70′ tall and up to 24″ in diameter, though large individuals can reach over 80′ in height. They typically live 100 years, rarely more than 150 years. In the forest the trunk is usually unbranched for half its length and the crown is narrow and short. In the open the trunk usually divides near the ground into a few widely ascending branches and the crown is dense and long. The branches are opposite, widely spreading, and ascending. 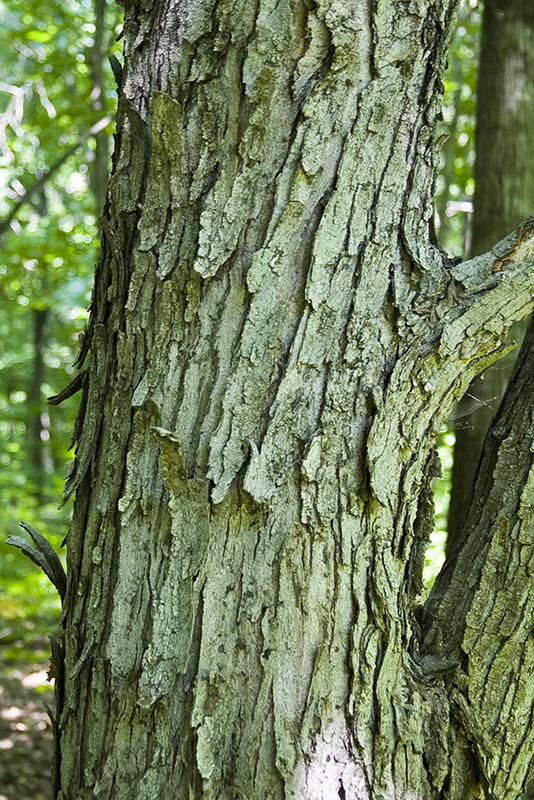 The bark on young trees is silvery gray and smooth with random, vertical cracks. If it is bruised or scraped it emits no odor. On mature trees the bark is gray to dark grayish-brown. It is separated into multiple layers of vertical, plate-like strips with scaly ridges. The strips are attached in the middle but loose and sometimes curling at the top and bottom. The twigs are slender, shiny, bright red to reddish-brown, and hairless. When crushed they do not emit a rank odor. The sap of a freshly cut twig is clear. Opposite twigs appear in a V-shape on the branches. Younger twigs have obvious, small, white, pore-like openings (lenticels). At the end of the twig is a smooth, shiny, reddish, ⅛″ to ¼″ long, blunt, terminal bud. It is composed of 2 to 5 pairs, but usually 4 pairs, of overlapping scales. The buds are dark brown, egg-shaped to elliptic, ¼″ long, and blunt at the tip. They are composed of 6 to 10 dark red overlapping scales. The terminal bud is red and relatively short. The leaf scar is have V-shaped and has 3 dots (bundle scars). The leaves are opposite, stalked, 2½″ to 4″ long, and nearly as wide. The leaf stalks are red or at least show some red. There are no prominent stipules at the base of the leaf stalk. The blades are palmately lobed with usually 3, sometimes 5, lobes. The lobes taper to sharply-pointed tips. The space between the lobes (sinus) sharply V-shaped. The two bottom lobes, if present, are much smaller than the two lateral lobes. The lateral lobes are cut ¼ to ½ of the way to the base. The central lobe is more or less parallel-sided below the middle, widest at or just above the base, then tapered to the tip. The sinus at the base of the leaves is open and the two bottom lobes do not overlap. The upper surface is light green and hairless. 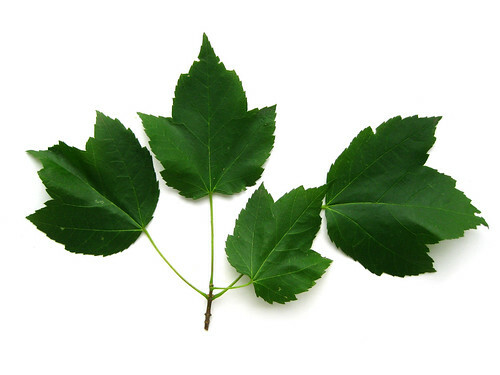 The lower surface of young leaves is paler green and hairless or sparsely hairy. 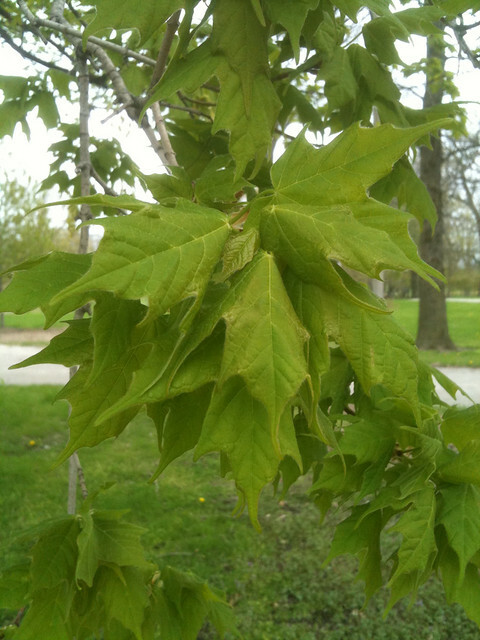 The lower surface of mature leaves is often strongly whitened, glaucous, and hairless or sparsely hairy along the main veins. The margins are irregularly toothed, including inside the sinuses, sometimes appearing double-toothed. The teeth are small. The sides and tip of the leaf do not droop. In the fall the leaves turn scarlet red, orange, or yellow. Fallen leaves break down quickly. The inflorescence is a short, dense cluster of flowers from lateral buds on the branches. 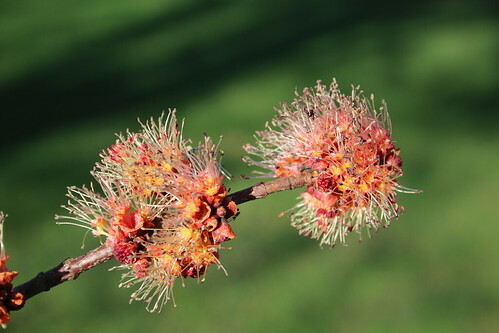 Male and female flowers are borne on the same tree and but on different branches. They appear identical, having both stamens and pistils, but usually only one of the organs is functional. They are produced in late March to May, long before the leaves appear. The flowers are pollinated by wind and bees. The fruit is a pair of dry seed cases with papery wings attached (double samara). They occur in clusters that droop downward from long stalks. The stalks are longer than the wings. Each double samara is more or less in the shape of an inverted U, connected at the top with the wings spreading apart at about a 60° angle. The sometimes appear parallel or almost parallel. Individual samaras (or keys) are ¾″ to 1½″ long and hairless. They are slightly connected to each other when young and separated at maturity. The seed cases are plump. The wings are typically ½″ to 1″ long. The keys are green initially, turning red as they age, then tan when they are mature. 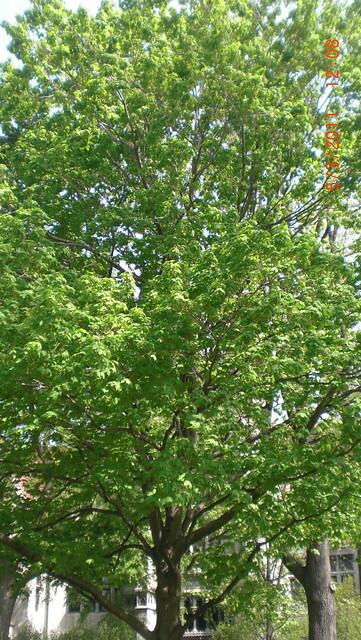 They mature from April to June before leaf development is complete. They fall during a 1 to 2 week period from April to July. Paired keys are shed individually. Usually only one seed case contains a single, viable seed, although sometimes both contain seeds, sometimes both are empty. 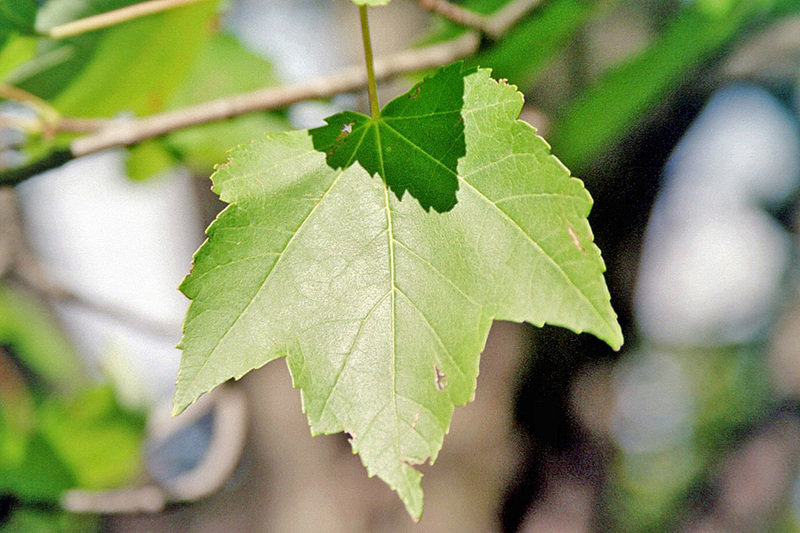 Mountain maple (Acer spicatum) is usually a tall shrub, sometimes a small tree. The terminal lobe of the leaf is less than half the length of the entire blade, and is tapered along the sides all the way to the crotch. The inflorescence is an erect, 1½″ to 3″ long spike. 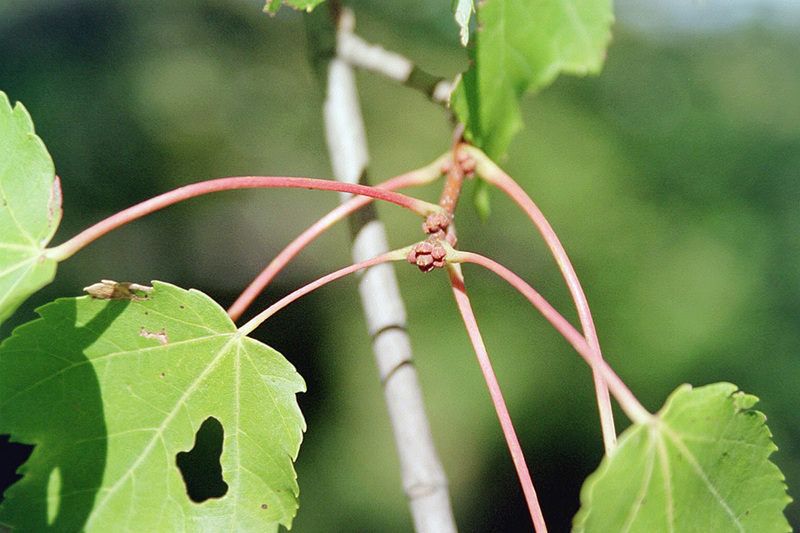 Ocellate gall midge (Acericecis ocellaris) causes a flat, purple-ringed, yellow “eyespot” gall on the upper leaf surface. Septoria Leaf Spot (Septoria aceris) produces dark brown or tan spots with light brown centers on the upper leaf surface. 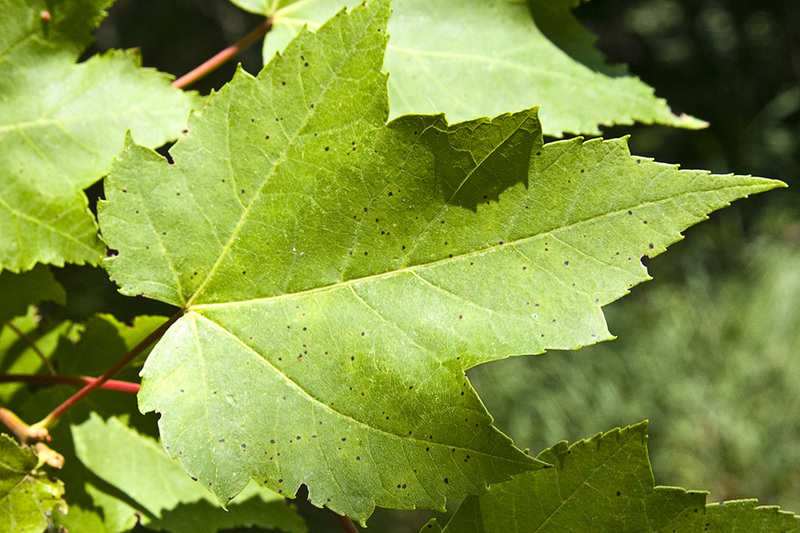 Tar Spot (Rhytisma americanum) forms few large black spots on maple leaves. 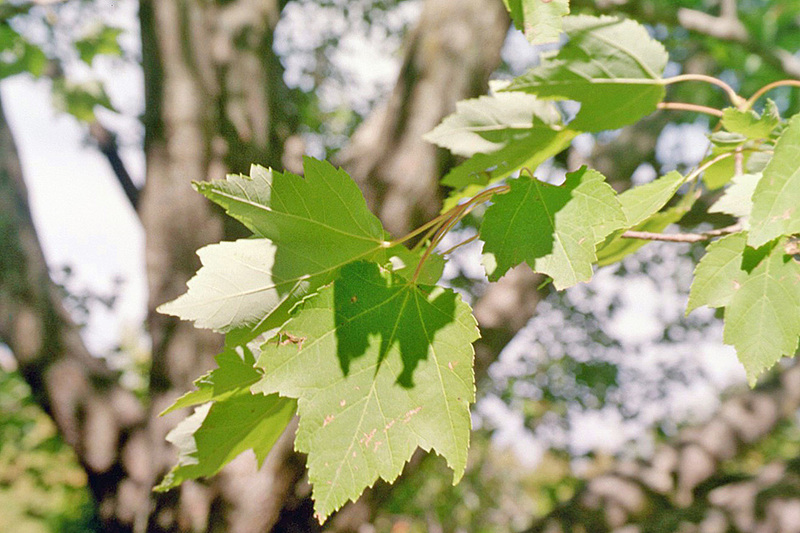 The champion red maple in Minnesota is on state property in or near Kerrick, in Pine County. In 2009 it was measured at 80′ tall and 95″ in circumference (30″ in diameter). A New York City street tree native to North America. A detailed look at characteristics of Red maple (Acer rubruum). These images and narrative can help to accurately identify the plant during different seasons of the year.